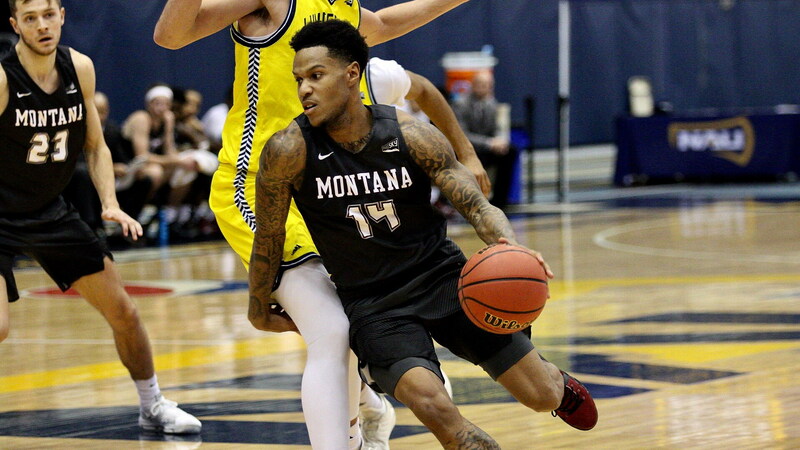 Montana began its Big Sky Conference title defense with a road win over Northern Arizona on Saturday afternoon, overcoming a halftime deficit to win handedly, 86-73. The Grizzlies led for the final 16 minutes, 30 seconds of the game, including by as many as 16 points. The Grizzlies had five players score at least nine points, including a pair of scorers with more than 20 points. Ahmaad Rorie scored a season-high 24, including four three-pointers, while Jamar Akoh nearly recorded a double-double with 22 points and nine boards. Montana trailed by nine, 41-32, with 1:45 to play in the first half, but over the next 70 seconds scored eight consecutive points to get within a single point at the intermission. Early in the second half, Montana used a 12-4 run to turn a three-point deficit into a two-possession lead. In the first half, Montana was connecting from deep, hitting seven three-pointers from four different players. In the second half, the Grizzlies pounded the paint, with Akoh scoring 16 of his 22 points. Over the first 9:30 of the second half, Montana made its first 12 two-point field-goal attempts, and overall on the day, the Grizzlies made more than half of its shot attempts. Montana led by just five, 65-60, with just over 9 minutes to play, before scoring on its next four possessions during a 9-0 run to push the lead to 74-60 with 7:25 on the clock. The Grizzlies led for the final 16:30 of the game. Montana shot 54.2 percent from the floor, marking the seventh time this season the Grizzlies have made at least half of their field-goal attempts. Montana made nine three-pointers (seven in the first half), the eighth time this season it has made eight or more treys in a game. Four different players hit a triple, led by Rorie’s four and Bobby Moorehead’s three. Nearly half of NAU’s field-goal makes (11 of 23) were from beyond the arc, but the Lumberjacks were just 2-of-11 from deep in the second period. Montana out-scored NAU 40-20 in the paint. Montana had more rebounds than its opponent for the second consecutive game, out-rebounding NAU 37-31. Montana turned the ball over just 10 times, tied for the second-fewest of the season. Rorie scored a season-high 24 points on 10-of-16 shooting, including 15 points in the first half. During the 8-0 run to close the first half, Rorie had five of Montana’s points. Akoh made his first seven field-goal attempts and finished the day 8-of-11. Sixteen of his 22 points came in the second half, including 11 in the first 5 minutes of the second half. With Falls primarily guarding Hines in the second half, the guard shot just 1-of-6, scoring six points (after scoring 16 in the first half). Freshman Mack Anderson saw 13 minutes of action, his most in more than a month, scoring two points and collecting three rebounds.